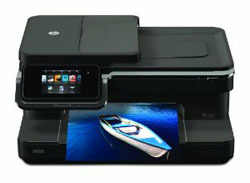 Trusted Reviews has tested an inkjet All-in-One printer from HP called HP Photosmart 7510. The HP printer is able to print up to 13.5 pages per minute, or so HP claims. Trusted Reviews ends up giving the Photosmart 7510 a good review with an overall score of 8 out of 10 possible points. The inkjet printer scores highest on features, a little lower on print quality and value for your money, while it scores lowest on print speeds. This HP printer has a lot of nice features and makes prints of good quality. It seems the only thing hindering it from getting a top score is the relatively slow print speeds. Read the full review of the HP Photosmart 7510 All-in-One printer here.